Property 11: Fantastic apartment with balcony centrally located and quiet & modern facility! Enjoy togetherness and escape from everyday life! Relaxation and pure relaxation! Property 22: Enjoy togetherness and escape from everyday life! Relaxation and pure relaxation! Apartment Barbarossa - at the foot of the Kyffhäuser with the cycle path outside the door! 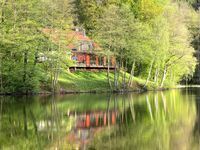 Property 42: Apartment Barbarossa - at the foot of the Kyffhäuser with the cycle path outside the door! Holiday apartment - "Roll Mühle"
Property 43: Holiday apartment - "Roll Mühle"
Es war sehr sch&ouml;n! Ein echtes &quot;Rundumsorglospaket! &quot; Sch&ouml;n, dass auch so sehr an die Kinder gedacht wurde. Besonders gut war die Betreuung durch Familie Herold. Wirklich gute Seelen, die uns bei allen Fragen gerne weitergeholfen haben. Besonderen Dank an die beiden. Wir kommen gerne wieder. Ps. Stollberg ist eine der sch&ouml;nsten St&auml;dte die wir bis jetzt kennengelernt haben.